So, I was having a little bit of a problem with my toilet. It was draining VERY slowly. 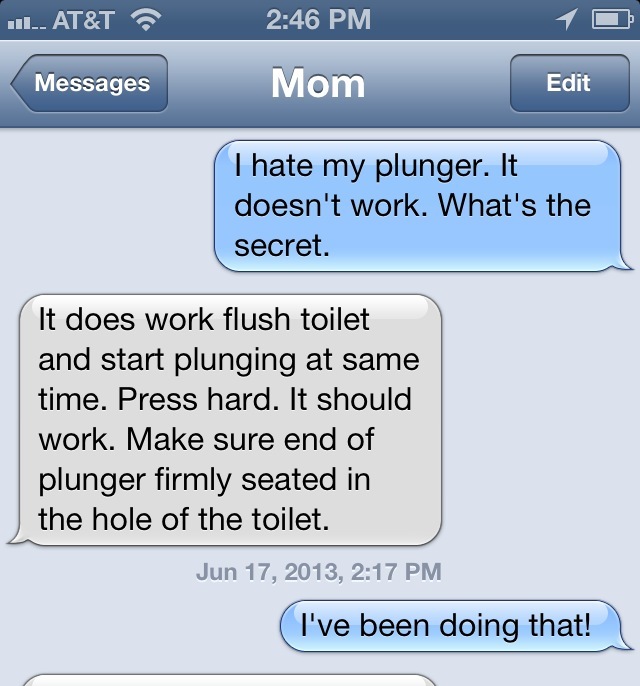 I figured it was a simple clog that could easily be fixed with a good plunging. So that’s exactly what I did – but without the intended results. It was late at night and I got tired of dealing with it, so I went to bed. The next morning I was in a rush to get to a baby-sitting job, so I left my apartment without using the bathroom. Clearly it was more important to be on time than to relieve my bladder. Nothing like putting a problem off! Other problems I have texted my mom about: 1. How long does it take to boil an egg? 2. What kind of fabrics can’t go in the dryer? 3. I find my hair all over the apartment. I think I’m dying! I was still having no luck , and I really didn’t want to call my landlord with a clogged toilet (because that would be embarrassing). So I decided that I deserved a little break. I wish I could say that I was doing something productive like laundry or my dishes, but the truth is I was playing Candy Crush on my cell phone. I was so immersed in my game that I didn’t realize that the toilet was still running. The next time I went in my bathroom, the entire floor was covered with water. The toilet had completely overflowed and water was everywhere! The water had started making its way into my bedroom as well. At this point, I had no choice but to call my landlord (and I thought a clogged toilet would be embarrassing). By the time the maintenance man arrived, I had managed to stop the flow of water and was using every towel in my apartment to sop up pool from my bedroom. Even though he spoke very little English, he still gave me the “Oh, stupid girl” look. (The same look I received just a week ago in response to the incident with my car.) He used some sort of snake/hose/somethingorother to investigate the problem. Of course he found none because the toilet seemed to be in perfect working order now that he was here. Before leaving he told me, “When water is full – no flush!” There were also some emphatic hand motions that accompanied the statement. He must think I am a giant idiot. Maybe I am. If I hadn’t been so engrossed in a stupid cell phone game, I might have noticed the flood in my apartment a wee bit sooner and not been stuck doing 3 different loads of laundry that night. Argh! I’m considering changing the title of this blog to “The Dumb Things I Do”. There’s nothing worse. Of course, if I hadn’t had so many dirty clothes lying on the floor, maybe I wouldn’t have had to do so much laundry!! ← Have you ever been THIS tired?